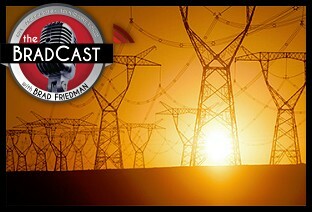 " 'Absolutely Doable': California to Move to 100% 'Carbon-Free' Electricity by 2045 (Probably): 'BradCast' 8/30/2018	"
« PREVIOUS STORY "'Green News Report' - August 30, 2018"
"'Absolutely Doable': California to Move to 100% 'Carbon-Free' Electricity by 2045 (Probably): 'BradCast' 8/30/2018"
DISTANCE FROM THE EARTH ( our only know habitable planet) TO THE SUN.The origin point of ALL our energy. Not to be picky, but the earth-to-sun distance about 92.96 million miles and that figure looks like this: 92,960,000. This is less than 1/1000th of the figure that Phillips Ricketts cites. Probably, it is just a typo. Nobody's perfect, as we all make errors. He's right about the other stuff, though. The rounded up figure of 93,000,000 miles is called an "A.U." or "Astronomical Unit". And as it happens, we are now just a little over 1/3rd of an "F.U." away from the most important election in American history. So vote as if this nation's survival as a nominal democracy depended on it, because it does. And if you do, you will have helped this nation to extend its existence a good many "F.U. "'s into the future. "F.U. ": this time, it's a good thing to have plenty of. Don't say you've given your last one! Geology is also a science. Conventional nat. gas peaked in the USA in 1973 and has declined in half since, mostly since 2000. California will be free of natural gas powered electricity in 2045, but probably not in the way this campaign is promoting. Fracking is a short term, toxic bubble. The early fields in Texas and LA/Ark. have peaked. In 2045, our descendants will be lucky to have any concentrated energy to burn for electricity. I've used solar PV since 1990. It's great but it's not going to replace our "current" consumption, pun intended. It also takes fossil fuels and minerals to make, move, install solar and wind power systems. If we were smarter we'd be thinking how to do this on a real scale, not the P.R. approaches like the California effort. Cutting expenditures on the war machines would be a good place to start. California is also building more and wider highways which are not built with solar panels ... asphalt, concrete, steel are all fossil derived materials. Perhaps the biggest obstacle will be how to feed 9 billion as the fossils deplete. Before fossils were mined our population was about a billion. It was a privilege to live at the time of peak everything, but now comes the hangover. The party's over. Entropy is not a good idea, it's the law! They better hurry (Mysterious Zones of The Arctic).